Michael introduced me a couple of weeks ago, so it’s about time I shared more about our new business. Working at Google I saw tremendous growth in online and witnessed many people finding opportunities and doing well. After 6 years watching others succeed, and seeing the scale of opportunity remaining, I decided the time had come to give it a shot myself. I wanted to do something B2C and experience suggested that industries with a couple of large, offline players dominating the market potentially provided a good opportunity. This is because margins are likely to be higher, and customers are more likely to be keen to try out a new, interesting and innovative company. Eyewear fits this perfectly. OPSM and Specsavers have well over half the market between them and currently only operate offline here. Michael, Mike and Jodie had spotted the opportunity on a previous buying trip to China, realising that the margins being charged by these giants must be significant, given manufacturing costs. Together we developed a more detailed plan, and became convinced that there was an opportunity to retail cool and distinctive eyewear at prices that allow people to own a collection to match every outfit and mood, not just a single expensive pair they own for years. The name Sneaking Duck came from an evening with pizza and wine and the Igor naming guide - we wanted something cool and memorable, that would conjure up a fun and cheeky image in peoples’ minds. We steered away from ‘functional’ names, instead looking for something interesting that we could build our brand around. In a few weeks we’ll be launching a well-edited range of frames to the Australian market - sign up for updates at www.sneakingduck.com or like us on Facebook. Every frame in our range has been carefully selected so that people can build up a ‘frames wardrobe’. Customers will browse and choose online before entering the technical details of their prescription. A few days later the frames arrive. As we tested the idea with friends, the most most common challenge raised was ensuring fit. It’s for this reason we’re creating a fun online retail experience where you can see yourself in frames before buying, as well as offering a very generous returns policy. Price will be competitive and simple - every frame at $180, including prescription lenses coated against reflection and scratches. Buying multiple pairs is what we’re all about, so every additional pair on each order comes at half the price, again, including lenses. This puts our prices well below comparable offline products. The only ‘extra’ we’ll be charging for is ultra-thin lenses, but certainly not hundreds of dollars extra like on the high street. This simple approach is in marked contrast to the more common approach of a seemingly competitive advertised price to draw in customers, that then gets inflated by numerous lens, coating and multiple pairs options. What are your thoughts on our pricing point and strategy? Setting up a new company after 6 years at Google is an incredible journey. 22Michaels kindly invited me to share some highlights - you can read parts 1 and 2 of a 6 part series here. Great to see MkII of the business coming together and I'm sure it will be as much as a success as MkI. Quick question for my fascination...when you did your analysis, did you find a reason why the big players were offline only? Money for Nothing - Great question, and something I've wondered about. I haven't got a definitive answer, just my own opinions and hypotheses. Presumably OPSM and Specsavers have considered online, but decided that offline provides better financial returns. I note that Specsavers in the UK do retail online, however that's in a market where there are several online players and a greater e-commerce in general. Feryx, April - thank you for the enthusiasm! 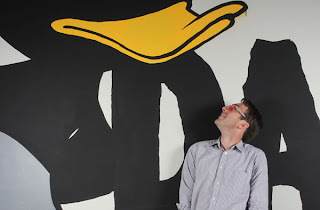 :-) Please sign up at www.sneakingduck.com and you'll be the first to hear when we go live. I prefer to scout for some great deals for eyeglass for me to use in front of my computer. My eyes is killing me as of the moment. can I claim my health fund when purchasing through you? Medibank customer - Yes, we are registered with Medibank and will provide appropriately itemised receipts. We are in the process of registering with other health funds. Will you make glasses without prescription lenses? I like to wear them sometimes to match an outfit. I don't actually wear glasses normally. It appears that you are doing something slightly similar to what I've seen with Warby Parker (www.warbyparker.com) although at a different price point. Competition is good and best of success in your new venture! JP - we're definitely planning on bringing over all the best & relevant learnings from Shoes of Prey. Warby Parker are pretty cool - very much agree that competition is good! Hi Mark, great concept and looks like a good business model. But in way of feedback, I think your sites homepage lets you down. I think it could potentially be losing you a lot of engagement and sales. In that, you have such a great proposition and personalities, but I have to dig to your 'about' page to find this. The fun of your USP and proposition is apparent in this blog and the about page i.e. "We love cool frames and we love having a pair for every mood. We're tired of having one mega-expensive pair we wear until they break. In just a few clicks, Sneaking Duck allows you to build a wardrobe of frames to match every outfit." WHY haven't you got your USP in a Tag Line on your homepage? i.e. "NEW FRAMES everyday; why not match every outfit?!" It should be the very first thing I, as a customer should see, to start your connection with me, and it has the intrigue element of - being a different and new prescription eyewear concept, and so starts a loop in me, in that I want the details of this new concept, so I will read on more and engage with your site. Then I should find the details, whilst absorbing more of your message and personality. And at the about page I find your proposition and message are consistent with your personality and your sincerity- with your own first hand need and use for your own product giving you the impetus and passion for creating the business. Obviously- you'll need good design and font choices with great impact, to give your proposition that fun immediate appeal. "Sneaking Duck - is a bit awkward and nerdy, like us, but it's sneaking us into the periphery of cool with awesome new frames everyday." It sets a great fun tone, to your USP message and adds a 'tribe buy in' element to your message. Wack a small headshot of yourself next to the phrase, grinning, and you have an immediate credibility and personality, that a new customer can trust and decide to look at the site more. Just my 2 cents. But at the present time your homepage looks to me like it could be that of any other online eyewear retailer, (which is exactly what you don’t want) and without coming there from this blog, I wouldn’t have known about your great new approach or proposition, and would have clicked off the site fairly quickly. So I am sure your losing many potential customers that you have worked hard to acquire. If you can change that to to visitors immediately intrigued by your USP or tagline on landing on your homepage, wanting to learn more, with a smaller bounce rate, I'm sure this will positively impact your sales. Thanks very much for sharing your story, it's generous of you, and helps all of us. Good luck and I wish you much success. Thank you so much for sharing your thoughts here - it's really useful to get views like this. We are always trying to find a balance between a clean, simple layout with good navigation as well as getting the right messages into the right places. I really like some of your suggestions and will be taking these on board as we keep developing our site.